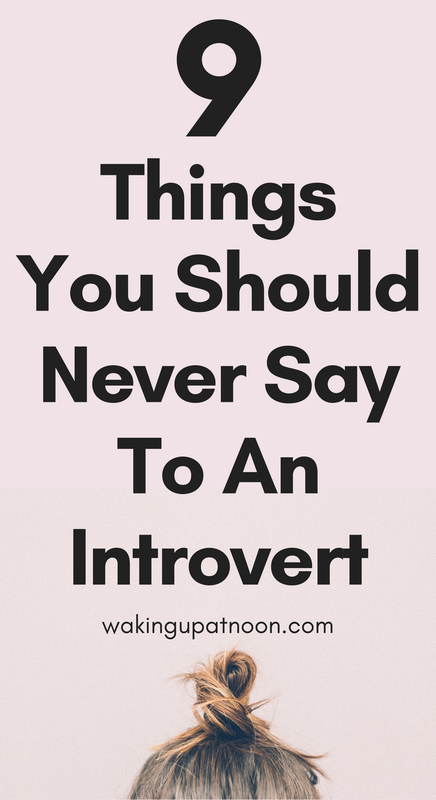 It's easy to feel pressured to act more extroverted and a lot of people feel the need to change introverts as if it's something to be ashamed of. 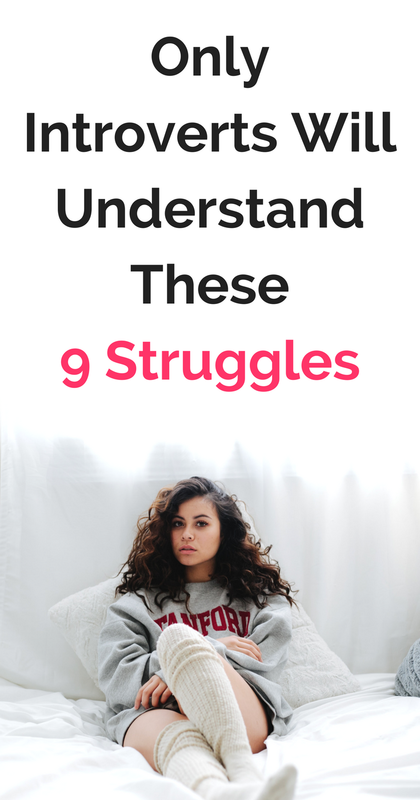 So just incase you've met an introvert and you want to know how to not piss them off, here are the 9 things you should never to say an introvert. Ever. If I had a pound for every time someone has said this to me. This one makes me mad because they're basically insulting you and pointing out a flaw in your character. How would you like it if I turned around and said 'You're really loud.' Would you take that as a compliment? Would it make you feel good? No, you'd be annoyed at someone stating an observation that they don't like about you. So what if I'm quiet? Do you really feel the need to point that out to me? Does it make you feel better about yourself or superior in some way? If you have nothing nice to say, keep your opinions to yourself and don't let the fact that I'm quiet bother you to the point you need to make a deal out of it. Sorry, I didn't realise I was a turtle. I don't need to come out of anything, I'm happy in myself and I'm not going to change because I'm not extroverted enough for you or you think I need to be louder or more confident. Maybe you need to get back in your own bloody shell. Just because I'm not making as much of a contribution in a conversation doesn't mean there's something wrong. Yes, I might not be the loudest person in the group and I might be more reserved around people I don't know very well, but by you asking me if there's something wrong that just makes the situation awkward and puts pressure on me to talk more when I feel uncomfortable already. If I'm meeting new people, I'm naturally going to be more reserved, hence the introvert part. If you're someone who doesn't understand what being introverted is like, please don't say 'don't be shy' if we're with new people, it's extremely unhelpful and will just make me feel even more uncomfortable about the situation. Instead you could say, 'I can't wait for you to meet these people, they'll love you,' or something other than pointing out a weakness you think I have by being shy. I'm not hiding away in some cave, afraid of the world. I actually like working by myself and getting things done in my own time. If I wanted to go out more, I would do that. You may not want to spend time on your own but that doesn't mean everyone else doesn't want to. No, I don't need to be more like somebody else, you need to be more accepting of me and the fact that I'm introverted. By telling me to be more like somebody else, you're basically saying I'm not good enough and I need to change to be more likeable to you. Sorry but I ain't changing anytime soon. 7. Why Are You So Quiet? Please don't push me to do something you can clearly see I'm uncomfortable with. It's totally fine to push yourself to do things but when it's someone else making you do things you don't want to do, it's not ok. I once had someone in high school, who knew I was quite introverted and shy, who volunteered me to the teacher to read out a big section from a book in front of the class. Clearly this person was a top class a**hole and if you ever meet someone who purposely makes you uncomfortable like that, don't give them the time of day. I don't know if you think you're giving me encouraging advice by telling me to change the way I speak, but it does nothing except make me not like you. If I wanted to speak up more, I would. I'm a good listener by being an introvert and that's what I enjoy doing over 'speaking up' more. That sums up the main things people have said to me during my introverted life. Hopefully if you're an introvert you'll be able to relate to this and understand the struggles us introverts face. And hopefully if you're an extrovert or you're someone who has said any of these things to someone, you'll learn to have more respect for people who are different to you and accept that not everyone has to be really loud and outgoing. This post contains affiliate links which means I make a small commission through purchases but this is at no cost to you. I can totally relate. I am an introvert and I get asked that annoying question of why are you so quiet? I simply just ignore and not say a word. Can we introverts be left alone? I can so relate to all the points! I have only become confident enough in recent years to not take these things personally and realise that the problem is not in me, but within the other person. I really don't like when people tell me to not be shy as well, especially in large or new social situations...ugh. And all of my life thinking that I´m a stranger person and I ´m alone in the world...........and I see you and your comments. Today I feel very happy with me and the world. Cool post. We all have different personalities. Makes life interesting.